First Grade | Mother of the Year... AGAIN! Kate's helping with the grocery shopping. Kate LOVES to write. She loves to draw and she loves to write. She wants to take your dinner order, write your address, make an envelope so she can write you a letter, or just plain make a grocery list. She loves the idea that she is going to have a spelling test this week – although studying for it isn’t nearly as cool as the concept. At a recent book fair at school all Kate really wanted was the diary with a lock. I’m not sure she knows that is a book for personal deep thoughts – she uses it as a book of lists and locks it at night. 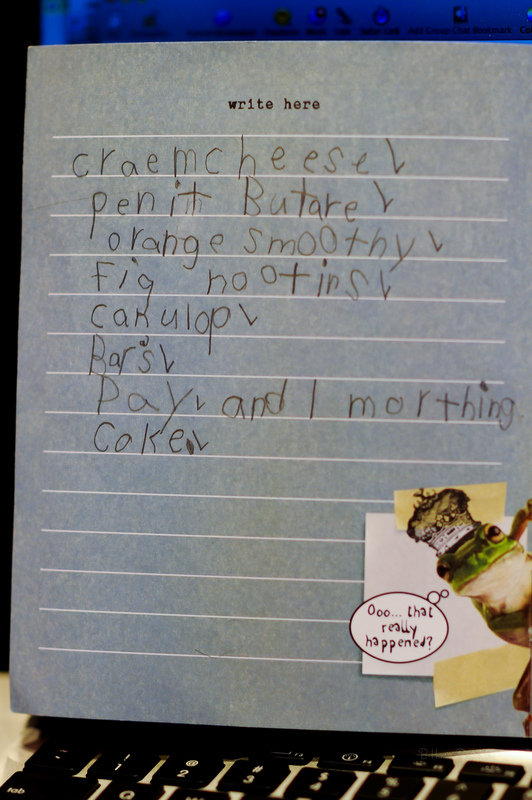 I love to see the way she sounds out the words and spells them – check out the latest grocery list. Another cool thing about her diary is she wants me to read it! Should the future only be so open. Open source that is! Her proudest entry (aside from the grocery list) was a couple pages deeper into the book, it was inspired from her most recent bus ride from school: Kate and Kameron Sitting in a Tree…. oh boy, was I really that young when that began?? This week New Hampshire celebrates Reading with the Read Across America NEA project. Reilly asked me to read in his classroom which I did today. I needed to bring Shea since she and I pal around. Reilly and his teacher had two little chairs set up and one big chair. He introduced us to his classmates. I was Mrs Hansen and Shea was his buddy sister. Since he seemed to be hearing a lot of Dr Suess books this week, he and I picked out our favorite books from our shelves to read to his classmates. I picked ish and he picked Frog and Toad. They are both fun books. The kids seemed to really like the ish book and it’s one of my favorites – that made it fun. Hi Mrs Hansen, can I tell you a secret? (girl comes up close and whispers to me with her lips touching my ear) I am in love with Reilly so much. Okay, keep that a secret okay? It was a totally cute moment to me and it made me appreciate going into his classroom and engaging with his classmates. If I lose a tooth at school and bring it to the nurse, she will give me a special little box to put my tooth in to keep it safe. The little box is in the shape of a tooth. She is not the tooth fairy though.